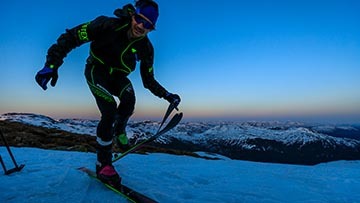 In 36 hours on touring skis across the Alps – this is the record attempt by Benedikt Böhm. 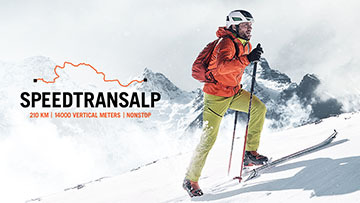 The SPEED Transalp is not only an athletic goal, but also dedicated to a good cause. 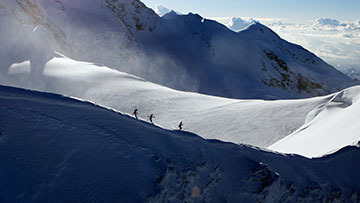 The Mezzalama Trophy is the world’s highest alpine ski mountaineering race and one of the toughest races for ski mountaineers. Learn more about the history and the development of the Trofeo Mezzalama. 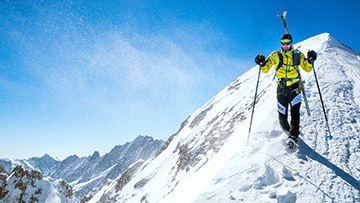 The Mezzalama Trophy is the world’s highest alpine ski mountaineering race, and one of the toughest races in the sport. Benedikt Böhm has stepped up to this challenge and reveals just what it takes to be successful. Mountopia participant Stefanie Traurig fulfilled her personal Mountopia, the Mount Everest Basecamp. 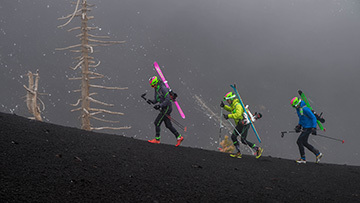 How close dream and nightmare were to each other, she tells in the Dynafit Blog. In the ISMF World Cup the world's best athletes compete in different disciplines. 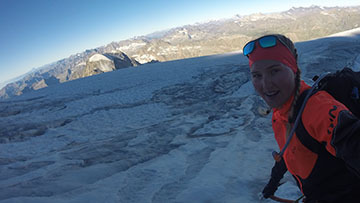 Dynafit athlete Johanna Erhart knows what it comes down to and explains the most important regulations. 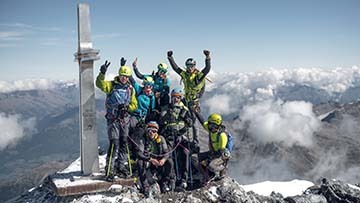 Großglockner, Ortler, Zugspitze in only three days, exciting impressions and voices of the Mountopia winners. 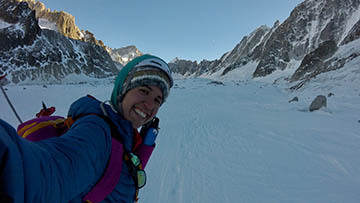 Dynafit athlete Nina Koch circumnavigated 8,165-high Manaslu in the Himalaya in 9 days. 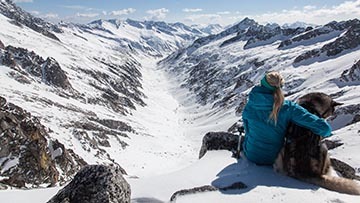 In our Dynafit blog, Nina tells of her experiences in Nepal. 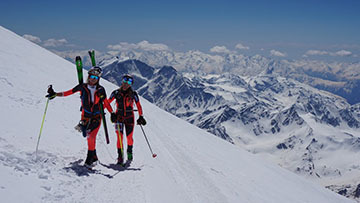 The six Dynafit Mountopia winners will participate in the Trofeo Mezzalama, the toughest ski mountaineering race on this planet. 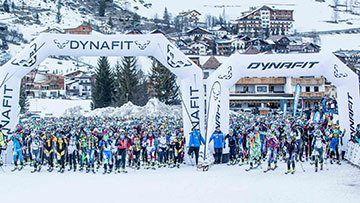 In our Dynafit blog, we introduce the Mountopia winners and their fighting spirit in detail. 3 Peaks - 3 Days is the finale project for the winners of the Mountopia Challenge Summer 2018. Using Speed Style, they will climb Grossglockner, Ortler and Zugspitze. We want to introduce them to you. 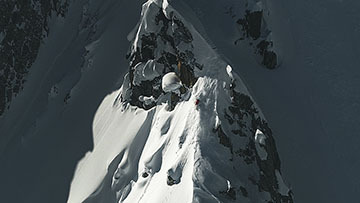 Taking the title of the highest peak in Europe, Mt. 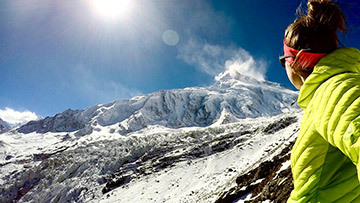 Elbrus tops out at 5,642 meters. 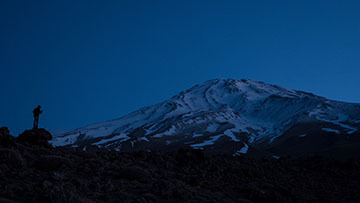 Dynafit athletes Johanna and Vroni took on this mountain and raced it in the Red Fox Elbrus Race. Nick Hendrickson accompanied them and tells us how it went. Race preparation for an ultra is key and very personal. However, there is a bit more planning needed prior to an ultra than before a normal short race. Here are my top five tips that are particularly key in my own ultra planning. Two friends. Two extreme athletes. Two exceptional athletes: Klaus Gösweiner and Markus Amon. 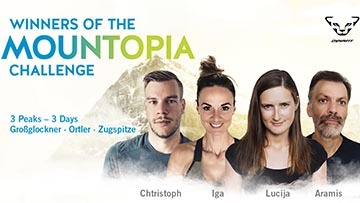 Their goal: to ultrarun straight across Austria - seven days, 500 kilometers and 20,000 meters of climbing. Nowhere is trail running preparation more critical than running long days in cold weather at high elevation. 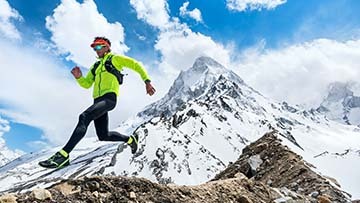 Alpine Runner Dan Patitucci shares his Himalayan running experiences and gives tips how to deal with elevation and what gear to bring. The path to an ultramarathon demands a lot of discipline. But how do you become an ultrarunner and how do you prepare for your first ultra? We asked our athletes and determined that there is not one single path to becoming an ultrarunner. Elisa Deutschmann, her Husky and 4 friends were out and about last season in a side valley in the Adamello Group in Italy. Due to the very long approach, this valley is usually deserted and bestowed on them wonderful expedition-like feel. 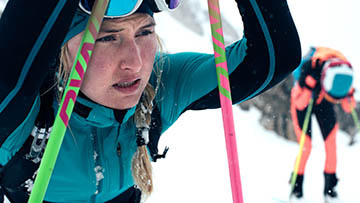 Hard training, perfect conditions, and unwavering passion for ski mountaineering. Lars Erik Skjervheim trained for three years for this day. Now, the weekend of May 19-20, 2018 is in the books. 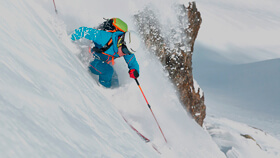 Freeride professional Eric Hjorleifson about the new Hoji Pro Tour ski touring boot. 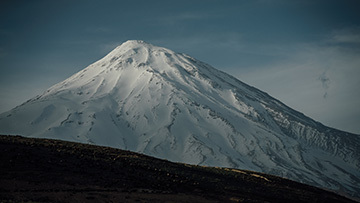 I stand on the summit of Damavand, the highest mountain in Iran. Behind me are 5,970 meters of vert (19,587 ft.) and 130 kilometers (81 miles). For 14 hours and 20 minutes, I made my body suffer while outwitting my mind. 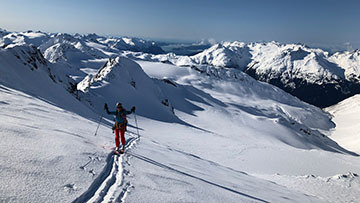 Ski, eat, sleep, repeat -- that's how Igone Campos envisioned Alaska and her Mountopia there. 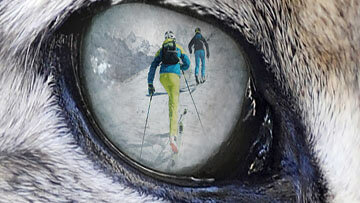 Here you can read about her adventures at the Chugach Mountains. In performance sports, recovery has been accepted for a long time as part of the training process and recognized as an integral part of training management. According to expert estimates, there are only 5,000 snow leopards left living in the wild. Join us on our Snow Leopard day to help protect the snow leopards from becoming endangered. 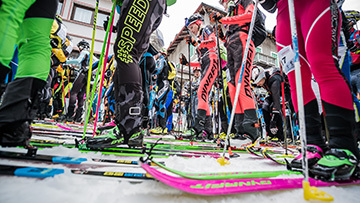 Why is Sellaronda Skiamarathon so successful? Because it’s an incredible experience, in direct contact with nature. 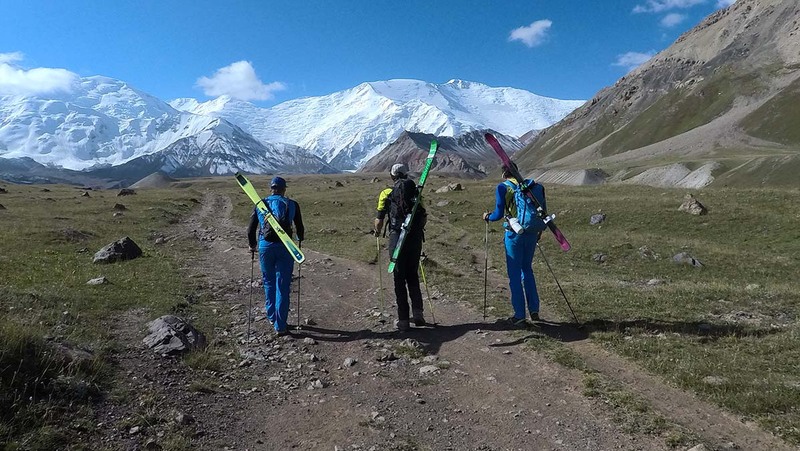 An experience report about an exotic ski touring trip to Crete, endless snow-covered expanse in the Lefka Ori mountains and Greek hospitality. 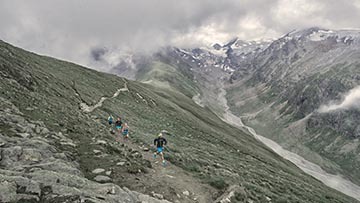 An experience report of Großglockner Ultratrail 2017 by blogger and runner Harald Angerer. 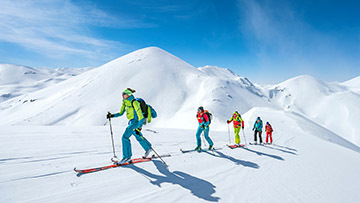 Starting from Rosenlaui in Switzerland, there is a ski mountaineering tour that combines ascents of the Wetterhorn (3692 meters), Mittelhorn (3703 meters) and Rosenhorn (3688 meters). As so often, life is different than expected. This also applies to the three protagonists of the film Inside Iran. Each of them has its own history, which more or less connects them with Iran.